For many of our customers, having a reliable source of hot water is key to many different operations including temperature control, wash down, hose stations, and for direct use in their processes. There are many options available for hot water generation beyond the typically used fire tube heaters. Each situation where hot water is needed is unique, but by using one of the following methods, you can always have a quality source of hot water for your plant needs. If you don't have a boiler and you only need a relatively small amount of hot water, then an electric hot water heater may work great for you. Often times, these small scale electric heaters are included as part of a Temperature Control Unit (TCU). They''re often bundled into a small, movable case on castors that can be moved around the plant as well. Plug in your water source and power, set the desired temperature of the water, and you''ve got a hot water on-demand system up and running in no time. These same systems are often used for temperature control on small scale tanks and can also include provisions for cooling as well as heating. Generally speaking, such systems are economical up to 325,000 Btu/h of heating and up to 100 GPM of water flow. They can be operated via a local control panel on the unit or they can be integrated into existing control systems. Often times, our customers ask us what is the best way to generator hot water on demand. As is usually the case, the answer depends on several factors. But generally speaking, there are two main methods of producing hot water from steam: indirect heating of water and direct steam injection. The best option depends on each situation. Let's start by examining indirect steam heating. One of the simplest and most common methods of producing hot water from steam is to use a heat exchanger and steam heat a water source to the desired temperature. This method is called "indirect" because the steam/condensate do not come in contact with the water source. But, even within this method of steam heating, there are many different options and choices to be considered. How much water do you need? What is the temperature rise of the water? How responsive does the heater need to be? Is a sanitary design needed? How much space is available? And the questions can continue. Aside from how the heat exchanger is controlled, let''s focus on two (2) common heat exchangers used for steam heating water. One method is to use a simple shell and tube heat exchanger. The water is heated by condensing the steam on one side of the heat exchanger and the flowing water on the other side is heated to the desired temperature. Such a heat exchanger is often supplied with the steam control components, condensate management components, and a control panel if needed. A shell and tube package hot water generator is an excellent choice for heating clean water and when your hot water demand is fairly consistent. The capacity of such a system is really only limited by the space that you have to fit the skid and/or your water or steam available. A second option for indirect steam heating to generate hot water is to use a gasketed plate heat exchanger for the service. The gasketed plate heat exchanger used in this service can help minimize the footprint of the installation, maximize the responsiveness (due to it''s smaller hold up volume), and provide a degree of flexibility for future expansion of such a system. Years ago, gasketed plate heat exchangers were seldom considered for a steam heating service due to concerns about the life of the gaskets, but today''s elastomers can be rated for in excess of 350 °F and have proven the ability to operate reliably in steam heating services. Alfa Laval has designed a plate style heat exchanger specifically designed for steam heating services by optimizing the plate design to fit the large temperature differences usually found in these applications. U-tube bundles are often used in shell and tube style heat exchangers for steam services to help in absorbing the thermal and pressure cycles associated with using steam as a heating medium. The plate heat exchanger may take these cycles even better as the gaskets react similar to an accordian and allow the plates to easy expand and contract. For this reason, the plate heat exchanger is generally favored in hot water on-demand services when the unit will cycle on and off frequently. You can learn more about these plate heat exchangers for use in steam heating water stream by downloading the attachments at the end of the article. 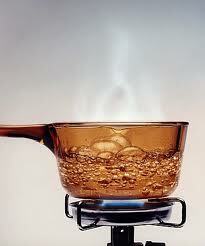 The second method of using steam to generate hot water is the use of direct steam injection. Just as the name implies, direct steam injection employs some method of introducing the steam directly into the water stream. This method is often recommended when it is not convenient or desired to retain the condensate from the steam. Perhaps the hot water is needed in a location where is no condensate return infrastructure back to the boiler (ie. the condensate is going to be dumped to drain anyway) or maybe the steam is from a waste heat source from which the condensate cannot be re-used. In cases such as these, direct steam injection can allow the full recovery of not only the latent heat from condensing the steam, but also the considerable sensible heat from the condensate as well. In an indirect steam heater, once the steam condenses, the condensate is usually at the saturation temperature of the steam when it exits (between 220 to 350 °F or more). Direct steam injection uses all of this sensible heat and puts it to work as hot water. Additionally, this method can conserve water as well because the steam utility source actually participates in becoming part of the hot water source, eliminating any flash losses. Also note that in order to use direct steam injection, the steam source must be at a higher pressure than the water source. For this discussion, we''re focusing mainly on hot water on-demand and we will not address heating a tank of water via steam injection. Once you've chosen direct steam injection, it''s important to understand that the way that you inject the steam to the water source is important, especially for on-demand hot water systems. Problems that can arise include limited turn down, nozzle plugging on the water side, hydraulic hammer and noise. One of the leaders in the manufacturer of direct steam injection units is PICK Heaters. PICK''s approach to this equipment utilizes an injection tube / steam float combination. A spring loaded steam float exposes only as much injection area for steam as required. This method helps eliminate noise and allows for a significant turn down factor (up to 10 times) and yields excellent temperature control. As a quick comparison, using a venturi-style mixing device, a typical steam velocity is 1400 ft/s. In a PICK Heater, the typical steam velocity is 200 to 250 ft/s. PICK also provides a turn-key approach to this type of direct injection heater which includes the steam control components and controllers (although bare heaters are also available). I Don't Have a Boiler, but I Need a Lot of Hot Water! For situations where customers need a significant amount of hot water, but don''t currently have a boiler, a direct-fired hot water heater is a great option for on-demand hot water. As the name implies, a direct-fired hot water generator uses fuel gas (waste methane, utility-grade natural gas, propane, or others) in a burner. The flue gases then contact the water in a small packed column to generate hot water on demand. There is no need for steam piping and controls. Just pipe your fuel source and your water source. Capacities up to 14 million Btu/h are available to make up to 470 GPM of hot water (depending on the temperature rise required). As shown below, these units come complete with a burner, controls, and an integrated water pump. An interesting case story derived from using a direct-fired hot water generator at a cement plant can be found here. I Have a Waste Heat Source Available, Can I Make Hot Water from This? If you already have a hot flue gas stream on site, a common method used to recover heat from these streams is to use a finned tube heat exchanger. Finned tube units work best on relatively clean flue gas streams or when combined with soot blowers. The use of extended fins to increase the heat transfer area per unit volume also makes them difficult to clean. A finned tube assembly can be inserted into a flue stack with water piped inside the tubes. The use of this type of heat exchanger is also used to recover heat from boiler flue gas streams as well (to preheat the boiler feed water). Obviously, the available capacity of a system like this will depend on the quantity of the flue gas, the gas temperature, and how much heat transfer area can be installed inside the flue.